Rotrex Troubles; Should'a turbo'd? - Miata Turbo Forum - Boost cars, acquire cats. I just installed the Rotrex kit with the inter cooler and a set of Fab9 coils on an otherwise stock 03 VVT miata. Now I can't get it to hold a steady idle and under 4.5K rpms it stutters/stumbles badly. Over 4.5K rpm it'll build boost quickly and pull hard as long as I stay in it. I can also hold a steady rpm (say 2K) for about 20 seconds before the rpm drops quickly and it almost dies. When driving at low speed in 1st or 2nd it bucks pretty violently. Am I the only who's had these issues with their Rotrex? I haven't found any topics like this on any forums. Your ECU and injector setup would be useful info for others to help you out. Your problem most likley is with the engine managment not the Rotrex. You should provide more information on your setup to include ecu settup settings etc. Having all the info would help haha. The ECU is stock. I'm running the injectors and fuel box that came with the kit. And by 'issues with the rotrex' I'm referring to the kit as a whole, the supercharger itself is pretty awesome. I assume my problem is with fuel delivery or vacuum. You should definitely ditch the rotrex. You can probably sell it for a couple hundred bucks. In fact I'll buy it now. 1. The Kraftwerks (if that's what you have) fueling was supposed to be mediocre. The NB kits came with something *similar* to an FM Voodoo Box and 350cc injectors. I think 350s are way too large for the stock ecu to handle and part of the problem. 2. Some customers of the Fab9 COPs experienced problems when installed alongside piggybacks. Try putting back the stock injectors, remove the COPs and piggyback. Drive around *without boost* to see if the problems disappear. If so, I'd add the piggyback in, without the injectors. Test again. Then add either the injectors or COPS, test again. Then add the other one. A wideband would be helpful here to determine whether you even need the injectors for your power levels. While you could jam the connector into the factory injector plug as hard as you wanted, in 1,000~1,500 miles they would come loose and the injectors would stop working properly. 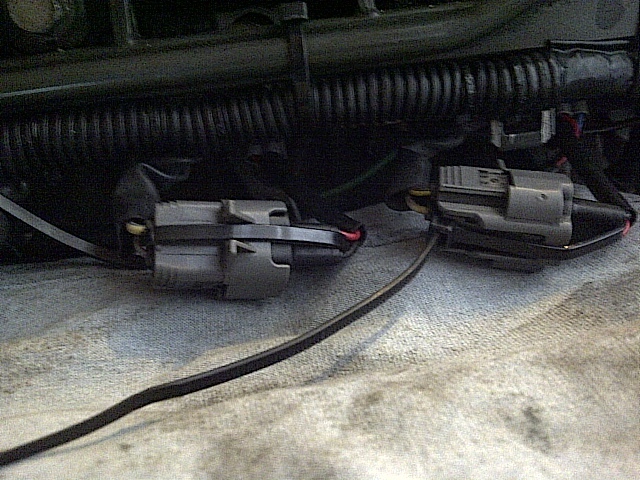 Where the injectors have clips to hold harness in place, the Kraftwerks plug had nothing. See below for fix. You can trust me when I tell you I have some experience with the Rotrex. Well, I popped the upper manifold off and checked the connectors, sure enough #3 & #4 were backed out ever so slightly compared to #1 & #2. I found my zip-ties and secured the clips as best as I could. I did this by threading the zip-tie between the wires on the factory injector clip, and then right around the backside between the wires on the DFC plug in one big loop. A picture (even a poor cell phone one) is worth 1,000 words, so Ill try keep this short. I also ended up re-looming my factory injector harness and zip-tied it to the fuel rail. The plastic shroud on the factory harness finally gave up and broke apart. Its now MUCH easier to tuck the piggyback clips under the fuel rail. The zip-ties I used were just about as wide as you would possibly fit in there. If you go any wider than this, its going to start pushing the wires out of place on the back of the connectors. That would be a bad thing. The pics don't show it, but the flat on the back of the black DFC to plug (the ones without the clips) now sits almost perfectly flush with the edge of the grey Mazda harness injector clips. I also trimmed the tails off the zip-ties before I reassembled. We'll see if this solves my issue. Go read the whole thread on M.net: Rotrex belt issue? - MX-5 Miata Forum its a doozy. I'll take a look at the Kraftwerks injector harness, check the pins and zip-tie the connectors, 1st. If that doesn't work, I'll try the stock injectors. This thread is a really excellent argument for a non-electronics Rotrex and a MS. I picked up my rotrex kit second hand and the guy inclued the TDR fuel and power cards, i used these instead of the kraftwerks fuel box....people don't love them because they're not competitively priced w/ megasquirt which offers more control, so if you can find someone unloading them you can get them for cheap. I was able to do a decnet tune for the street with them and I'm pretty happy. Last edited by hjkl; 05-06-2015 at 12:07 AM. Reason: I am a horrible typist. I am confused, is there a VooDoo box involved anywhere in this? IS a 'DFC' the same as a VooDoo box? The horrible driveability certainly could be caused by misfiring injectors resulting from bad connections. The piggy back that was provided with my KW kit was the same as the "VooDoo box" that FM provides. The "VooDoo box" name is FM's but the box is identical in everyway, as far as appearance of the boards inside. I'm sure it is made by an outside company for FM and KW. VooDoo Box, older Powercards, DFC (Digital Fuel Controller) are all the same thing. Kraftwerks, FM, Moss and FFS will all tell you they are different, but I've personally handled and disassembled all of them and the hardware is the same. Someplace I have the info about the company that actually manufactures them but I don't care to look it up atm. The "newer" Powercards are in fact different hardware, but work pretty much the same. Y'all were correct! The issue was the fuel box supplied with the kit. For what ever reason it didn't work when the system was in vacuum thus the stumble at lower RPM's and bad idle. I removed the fuel box and swapped the stock injectors back in. It started right up and ran fine (well as "fine" as it can with a supercharger on the stock ecu). I now have the MS PNP3 and even with a base tune there's a night and day difference. All that's left is getting a good tune. I wish I could've bought the kit without the electronics, it would've saved money and headaches for sure. The Grams Performance injectors can probably be reused with the MS, they are modern EV14 injectors. They are a bit undersized from what most of us run though. Those 350cc injectors are probably good for 225hp on the NB fuel system so that gives you a little bit more headroom than the stockers. Of course, now that you have a MS you can buy pretty much whatever sized injectors you want. If you go down this path its not worth spending the money unless you are buying an EV14 style injector. Injector Dynamics and Fuel Injector Clinic are both very popular around these parts. Since he already has em I'd use em too. If my stockers made 201 before actually running out of fuel, I think he should be just fine on a brotrex stock-ish setup with these. Glad you got everything figured out. We have the "cracked ebay manifold" thread stickied in the turbo section, I vote for sticky-ing this one for the supercharger section. Quick Reply: Rotrex Troubles; Should'a turbo'd?